A city-chain with a big selection of eggciting specials — Egg Factory’s menu gives you all day breakfast options and more, that go beyond sunny-side ups and scrambled eggs. Kothu Parotta — a delicious mix of scrambled egg and paratha pieces, tossed in masala, French Toast in cream cheese with blueberry preserve. The What’s Up Doc — a fresh carrot juice with a mysterious blend of fresh fruit too. Can you guess? For a menu that doesn’t let you down when it comes to all sorts of egg offerings. Staying true to the name, Egg Factory has a simple ambience of a grungy factory. From minimalist decor, pipes running across the steel grey walls, dim lights and quirky details, this place spells hipster. An eggcellent selection celebrating eggs, from regional specialities to international, the classic Eggs Kejriwal is a Mumbai street food speciality served with masala egg on toast. Try the Mexican frittata served with beans and salsa, or the herbed potato and peppers that take on a more Western influence. The spicy egg burji, or the simple but satisfying bread masala also make your selections harder. Apart from delicious street eats, they have a selection of eggs dishes from around the world. 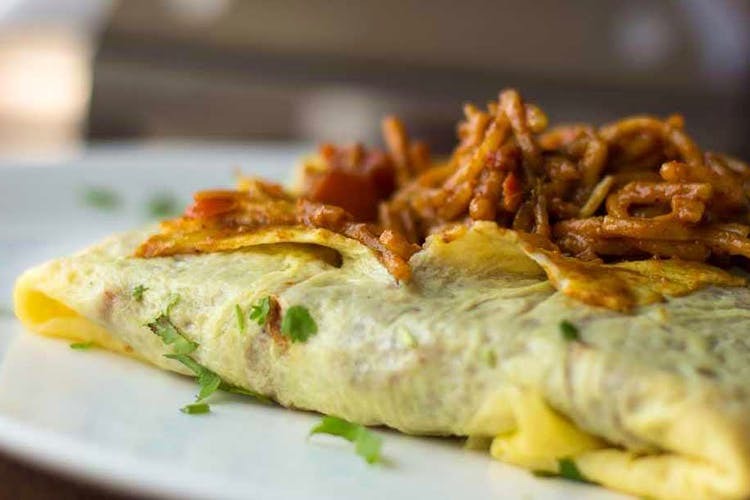 Try the Chinese-style egg curry, or the egg noodle wrap; the pesto egg curry. The Burmese Khow Suey is also a must-try. For the meat lovers, Egg Factory has a Oyako section that includes chicken and egg like subs, rotis, wraps, noodles and egg chicken kheema. The chicken carbonara with chicken bacon and Parmesan is a mouth watering Italian treat. The desserts aren’t spared the eggy goodness, we recommend the caramel custard or the Mango Cheesecake. With prime locations across the city, the Egg Factory is the perfect place to celebrate worldly cuisine and street food favourites, through their egg specialities. Not just limited to breakfast options, the best part of the menu is that there is a dish, with egg at the core of course, for lunch or dinner as well. Think egg biryani, egg curry and more.